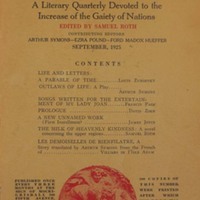 "A literary quarterly devoted to the increase of the gaiety of nations." 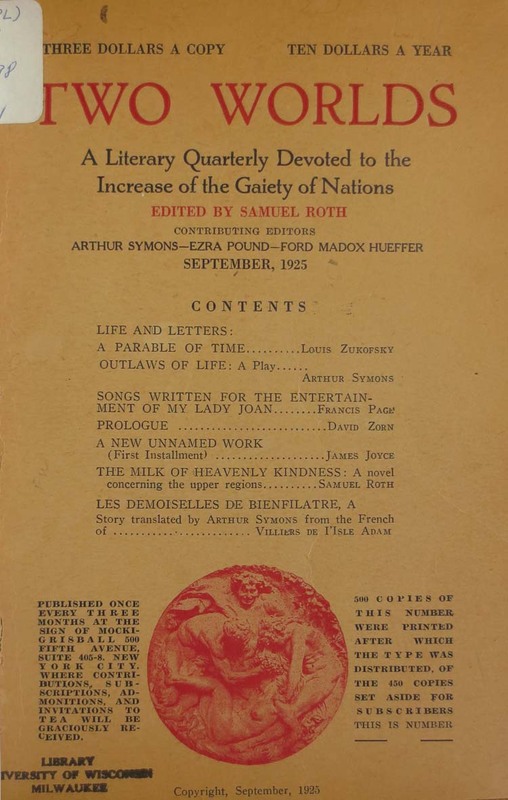 Edited by Samuel Roth; contributing editors: Arthur Symons, Ezra Pound, Ford Madox Hueffer. New York : Two Worlds Pub. Co.
Joyce, James , “A New Unnamed Work, Two Worlds, Volume I., no.1, Sept. 1925, pp. 45-54,” Digital Exhibits - UWM Libraries Special Collections, accessed April 22, 2019, http://liblamp.uwm.edu/omeka/SPC2/items/show/201.